Guy Maddin is a Canadian independent filmmaker. 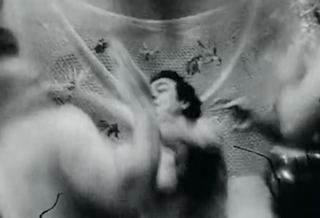 His work frequently recreates in amazing detail the style and techniques of silent films and early sound cinema. In addition, his movies typically toy with blurring notions of documentary and fantasy, such as in the pseudo-biographical film My Winnipeg; while several of his short films, such as Sissy-Boy Slap-Party, pay homage to the late '60s underground filmmaker Jack Smith. The 6th annual Sydney Underground Film Festival features the world premiere of Mike Davis’ President Wolfman, films by Guy Maddin, Bob Ray, Greg Hanson and tons more. The 2012 Brakhage Center Symposium has been programmed by curator Kathy Geritz and will examine the concept of experimental narrative over three days of screenings and lectures on March 16-18. Raw, half-naked violence explodes across the screen in a gritty tableaux of sweaty brutality in Guy Maddin’s short film Sissy-Boy Slap-Party. The 5th annual Sydney Underground Film Festival is showing twisted films by Usama Alshaibi, Jeff Krulik, Jon Hewitt, Joseph Guzman and more.